This action arises from the Harwich Planning Boards approval of a definitive plan creating a subdivision of land off Headwaters Drive. The subdivision approval process began in January 2005, when Peter J. Nyberg submitted an application to the Planning Board (Board) for approval of a subdivision for land shown on a plan of land titled Definitive Subdivision Plan of Land in Harwich, MA prepared for P.J. Nyberg, dated January 3, 2005, revised January 26, 2005, and prepared by Ryder & Wilcox, Inc. The plan submitted depicts eleven numbered lots with a cul de sac titled Jilma Way. Defendant James Marceline (Marceline) signed the plan as the owner of the land. [Note 2] After four sessions of a public hearing, on April 26, 2005, the Board approved the plan and its decision was filed with the Town Clerk (Subdivision Plan). As shown on Sketch A, there is a road configuration that begins at Queen Anne Road, Harwich, to the south, and travels north to where the road forks, with one tine continuing northwesterly and the other continuing northeasterly. The parties agree on the location of the portion of the road that runs between Queen Anne Road and fork, but disagree on the course Old Brewster Harwich Road takes northerly of the fork. Allison maintains that the road continues in a northeasterly direction and is the easterly of the two roads depicted by the parties. See Sketch A, where Allisons road is labeled Overgrown Vehicle Tracks. Marceline argues Old Brewster Harwich Road runs in a northwesterly direction and is the westerly of the two roads. See Sketch A, where Marcelines road is labeled Old Road Tracks. [Note 5] The divergence of the two roads creates a Y with the disputed area located within the v of the Y and the undisputed portion of Old Brewster Harwich Road comprising the stem of the Y. As shown on Sketch A, the area at issue in this case is bounded northerly by land now or formerly of OLeary and Kozak (within the area sometimes referred to herein as the Crescent), easterly by Overgrown Vehicle Tracks, southwesterly by Old Road Tracks and westerly along a ditch, at land claimed by Allison. All experts filed their direct testimony through affidavits filed on May 22, 2009, approximately two months before trial, with the exception of the Affidavit of Charles N. Rogers, which was filed April 8, 2009. With the benefit of that direct opinion testimony in mind, on July 7, 2009, the court took an extensive view of the Disputed Area and surrounding property in the presence of counsel and the parties experts. At the view the experts pointed out relevant monuments and topographical features which they believed were pertinent to the location of Old Brewster Harwich Road, as set forth in their respective affidavits. [Note 6] At the view, the court was able to see many of the topographical features shown on the Subdivision Plan including Overgrown Vehicle Tracks, and the triangular intersection of ways, as there are remnants of these features located on the ground, as pointed out by the surveyors. It was also possible to see topographical features of a road Plaintiff identifies as the right of way to Philip Ellis house, labeled Path, on the Subdivision Plan, as well as a ditch and swamp wetlands. 1. Freeman Allison, a resident of West Harwich, claims an undivided one-third fee simple interest in the Disputed Area derived by inheritance and conveyance from the interest of one John G. Doane, who was one of three grantees in a Warranty Deed dated January 15, 1869, recorded September 18, 1879, in the Barnstable County Registry of Deeds in Book 138, at Page 543 [Note 9], referred to in this action by the parties as the Source Deed, [Note 10] in which title was assumed by Allisons title expert. [Note 11] The parcel of land in which Allison claims his interest is that portion of parcel 2 described in the Source Deed which remained after the judgment issued in Registration Case 41818. (See Decree Plan, Ps Ex. 3). Allisons Parcel is shown on Ps Exhibit 53/Chalk A.
Pooles placement of Old Brewster Road based on the location of physical monuments and abutter calls, which can function as monuments in the chain of title, Ryan v. Stavros, 348 Mass. 251 , 259 (1964) (land of adjoining proprietors may be monuments), is persuasive. The court finds persuasive Pooles placements of the deeds recorded in 1853, in Book 55, at Page 271, in Book 55, at Page 393; and, in 1854, in Book 58, at Page 199. The 1869 Source Deed, recorded in 1879, from which Plaintiffs title derives, builds off of these earlier deeds. The parties surveyors agree on the location of the westerly boundary of Parcel 2 in the Source Deed. [B]eing the homestead on which said Ellis resides and some adjoining woodland and swamp bounded commencing at the northwest corner thereof at the junction of two roads thence running easterly by a road to land this day sold by me to Henry Eldredge, thence Southerly by the land sold to said Eldredge to land of Thomas Allen, Westerly by said Allens land to swamp, through the swamp to woodland supposed of Nehemiah Kelly, formerly of heirs of Judah Chase, thence northerly by said last named lands and the roads to the place of beginning, with the dwelling house and out houses and all other buildings thereon, with a right of way to the same across the land above named conveyed to Henry Eldredge as the same has been used by Phillip Ellis. Lastly, Poole points to the 1893 U.S. Geological Survey. This survey depicts Allisons placement of Old Brewster Road, but the road ends at Headwaters Drive and does not extend further into Brewster. See Plaintiffs Exhibit 15 (Allisons Old Brewster Road is highlighted in yellow). Rather, a railroad and Pleasant Lake Avenue, present day Route 124, are shown traveling between the ponds. This survey also does not depict a road consistent with Marcelines placement of Old Brewster Road. Despite the lack of continuation of a road between the ponds, Poole claims the 1893 U. S. Geological Survey supports his contention that Allisons Old Brewster Road is the road referred to in Allisons and Marcelines chain of titles because he believes the railroad was constructed over the portion of Old Brewster Road that traveled between the ponds. 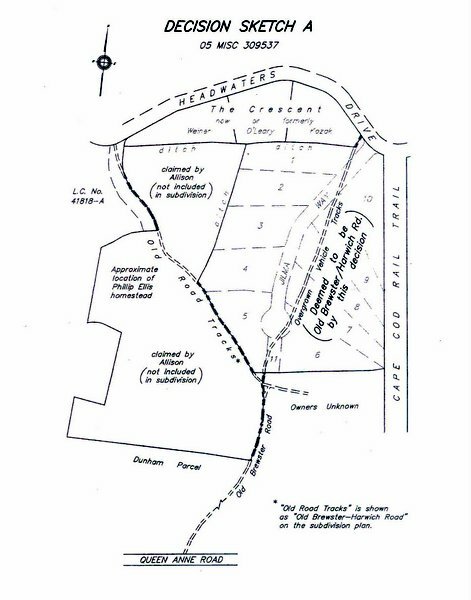 These documents support Pooles argument that the railroad was built over the existing Old Brewster Road and bolsters his claim that Allisons depiction of Old Brewster Road correctly locates the road. On the credible evidence presented, and applying the governing law, I find and rule that the Old Brewster Harwich Road is shown as Old Vehicle Tracks on Sketch A attached hereto, which adopts the location shown on Sketch Plans A-D, Plaintiffs Exhibits 30-33, prepared by Donald T. Poole to accompany Narrative of Outermost Land Survey, In regarding the land of Freeman Allison, dated October 16, 2006 (Pooles Sketch Plans). As a result, under Count II of Allisons Complaint, when the case is ready for judgment, the court will issue a declaration that Defendants have no claim of title to the Disputed Area. For the reasons set forth above, the court has not determined the quality of title to the Allison Property, asserted by Allison and Hallisey. The court requests that counsel (including counsel for the members of the Harwich Planning Board) confer about their joint or respective views about whether judgment may issue. In the courts view, the trial determining the location of Old Brewster Harwich Road in Plaintiffs favor disposes of the pending case subject, of course, to appeal on the issues decided, if any of the parties so choose. [Note 30] If the parties are in agreement with that assessment, they should so inform the court, not later than May 30, 2012, at which time the court will solicit a form of Judgment from Plaintiffs counsel and invite comment from all other parties. Thereafter, Judgment will issue, incorporating Sketch A . If the parties are not in agreement with the courts assessment, they should inform the court (and all other parties) in writing of their objections not later than May 30, 2012, and the court will proceed accordingly. [Note 3] Allison asserted his claims to this land at the hearings before the Board; however, Marceline also asserted ownership to the same land at the hearing, and the Board proceeded to approve the Subdivision Plan. [Note 4] Mr. Hallisey asserts a claim for at least a one-third undivided interest in the land shown on the Subdivision Plan. [Note 5] The surveyors also vary in their labeling of Old Brewster Harwich Road. Charles Rowley, Marcelines surveyor, titles Allisons version of the location of Old Brewster Harwich Road as an Old Road extending northeasterly from Old Brewster Road, and labels Marcelines version as Old Brewster  Harwich Road (See Land Court Registration Plan 41818A). See Chalk F, Sheets 1, & 3-10. Donald Poole, Allisons surveyor, labels Allisons interpretation of Old Brewster Harwich Road as Brewster  Harwich Road and Marcelines interpretation as Old Road  right of way to Phillip Elliss. See Pooles Sketch Plans A-D, Plaintiffs Exhibits 30-33 (also shown as Chalks B-E). [Note 6] The surveyors included Donald T. Poole for Plaintiff, and David A. Schofield and Charles Rowley for Defendants. [Note 7] The Planning Board of Harwich members, although defendants in this action, did not participate in the trial. [Note 8] The court is also in receipt of Defendant Marcelines Motion to Strike: 1. Sketch Plan on page 8A of Intervenor Halliseys Request for Findings of Fact and Rulings of Law and 2 and Intervenor Halliseys Reply to Defendant James Marcelines Request for Findings of Fact and Rulings of Law  Res Judicata Application of Two Prior Massachusetts Cases to Present Quiet Title Action, filed September 13, 2010. An Opposition was filed September 23, 2010. The court does not rely on Halliseys Sketch Plan nor does it reach the issue of the validity of Allisons, Halliseys, and Marcelines titles. Therefore, the court declines to rule on this motion. [Note 9] All future references to the book and page numbers of deeds refer to deeds recorded at the Barnstable County Registry of Deeds. [Note 11] The two other grantees were Alfred Eldredge and Levi Eldredge. [Note 12] The deed is executed under seal. Even assuming Marceline has standing to challenge Allisons title, which this court finds he does not, Marceline, as the party challenging Allisons status as a BFP, has the burden to prove that Allison was not a BFP. In support of his challenge to Allisons title claim, Marceline alleges that there was an unrecorded deed out of Allisons chain before Allison took title from Robert F. Allison, and therefore Allison took nothing through his chain. However, there was no evidence introduced that established that Allison had any actual knowledge of a title defect or was otherwise not a good faith purchaser. [Note 13] There is no information provided regarding co-defendant Sally Coughlan. [Note 30] The ruling in Allisons favor on Count II necessarily disposes of the counterclaims, as well as Count I which challenges the Subdivision Plan approval based on Allisons claim of title to the land shown on the Subdivision Plan.